Now can you monitor for porch pirates and other unwanted visitors while you're away from home. ’Tis the season for package theft. What good fortune, then, that Brinno has given us a new Peephole Camera as an early Christmas gift. 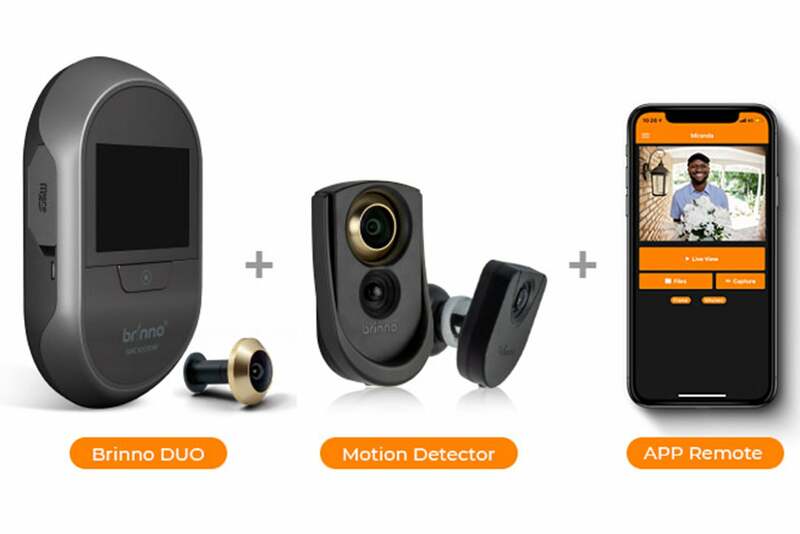 The Brinno Duo improves on past versions of its concealed camera with the addition of a smartphone app that let’s you view any doings on your doorstep even when you’re away from home. It’s an excellent way to combat porch pirates during the holidays and all year round. 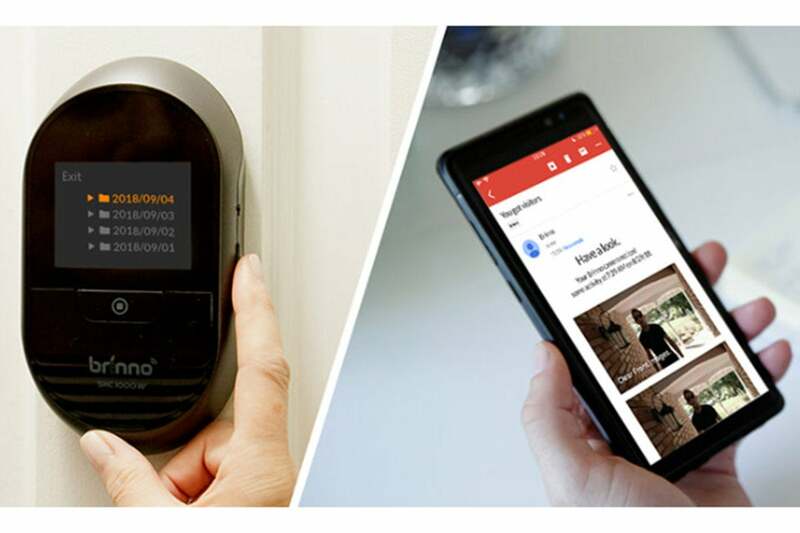 As with the Brinno SHC1000, the Duo consists of a camera unit with a 2.7-inch LCD, a separate motion sensor that can be concealed in a supplied door knocker, and an optical-grade-lens peephole. The installation is basically the same, too. Insert four AA batteries (supplied) and the motion-sensor receiver into the camera, and then take the motion sensor unit out of the door knocker casing, pair it with the receiver, and return it to the door knocker. The next step is to remove your current peephole from your front door and insert the Brinno peephole through the door knocker casing and into the front of your door. Depending on your door’s thickness, thread either the 12- or 14mm supplied barrel through the base flange against the inside of your door and screw it onto the back of the peephole using the included “tightening tool.” The camera then slots onto the flange on the interior side of your door. If you already have a door knocker under your peephole, you likely won’t be able to install Brinno’s. In that case, you can remove the motion sensor unit from it and mount it separately within 32 feet of your door using an included magnetic mount. The other part of the setup is pairing the camera with the Brinno app and connecting it to your Wi-Fi. It’s a curious process that involves entering the camera’s ID and your network’s SSID and password, then placing the back of the camera over you phone’s screen for one minute while the app flashes a succession of colors. As I found, there are a few ways this “color flash” step can fail, including forgetting to turn off your phone’s sleep mode, but when it works you’ll be able to see the camera’s live feed from your phone. The basic thrust of the Peephole Camera remains the same. It starts recording as soon as someone trips the motion sensor. If that person knocks on your door, the vibration triggers the knocking sensor and activates the display, so you can easily see who is at the door while the camera records another clip. Reviewing those clips remains a simple affair. A browse feature you activate from the camera’s menu automatically takes you through the days’ recorded activity. If you see someone or something you want to investigate, you can hit the camera’s shutter button to pause the clip for a closer look. The video quality remains far below what you’d get from an HD security camera, but it’s detailed enough for surveillance purposes, and the 90-degree viewing angle provides a solid head-and-shoulder view of anyone standing on your doorstep. The Brinno Duo replaces your current peehole with a discreet video camera whose feed can be viewed remotely as well as on a display on the interior side of your door. The app adds a new dimension, though. 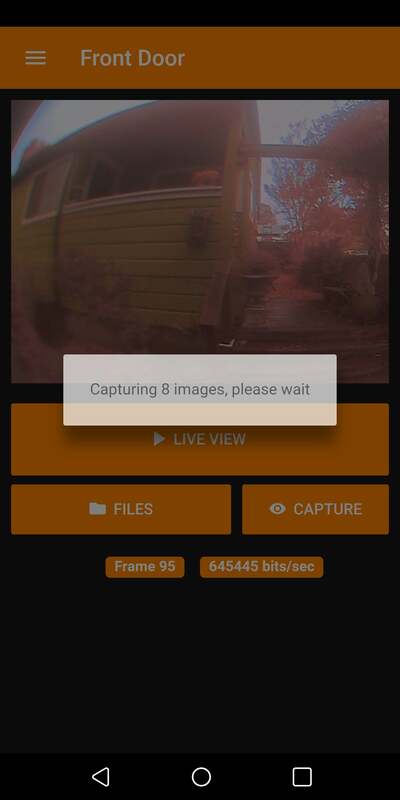 Where previously you had to wait until you returned home to review captured video, the Duo allows you to view a live stream and capture images on your mobile device. That gives you a fighting chance to catch package thieves and other bad guys in the act; plus, you can send evidence to the police straight from your phone instead of retrieving the camera's SD card once you're home. The app is pretty basic. The live feed pane and a play/pause button take up most of the top half of the screen. Beneath them is a button for capturing images from the feed, and another that gives you file access to those clips. Most of the controls remain on the camera itself. These are accessed through a simple menu you navigate with the up and down buttons on the side of the camera. In addition to the video clip library, this menu also houses the sensor and display settings as well as storage and battery level information. The live-viewing app also works as a remote control for capturing images with the camera. If there’s one drawback to the Duo, it is its activity alerts. It only offers alerts via email, and I found the delivery inconsistent. That aside, I try not to be tethered to my inbox for productivity reasons, so a push notification or text alert option would be welcome. Here’s hoping one is added to the next Peephole Camera. The earlier Brinno’s have been my favorite porch peepers thanks to their clever concealment and ease of use for my school-age kids. But they always seemed a little behind the curve compared with video doorbell, which let you see—and speak to—visitors even when you’re away. The Duo goes a long way toward rectifying this with its remote viewing app. It still doesn’t match the capabilities of the Ring doorbell and its competitors, but it doesn’t require costly cloud storage subscriptions either. If you’re looking for a simple, discreet way to monitor for package thieves, solicitors, and other unwanted visitors, the Duo is a great option. The Brinno Duo is a discreet way to monitor for package thieves and other unwanted visitors, whether you're at home or away.